'Casa do Alferes Curado' is a property, situated peacefully in the middle of nature near the village Maçãs de Dona Maria, between Tomar and Coimbra. It consists of two centuries-old country houses, which one of them is converted into a comfortable guesthouse. 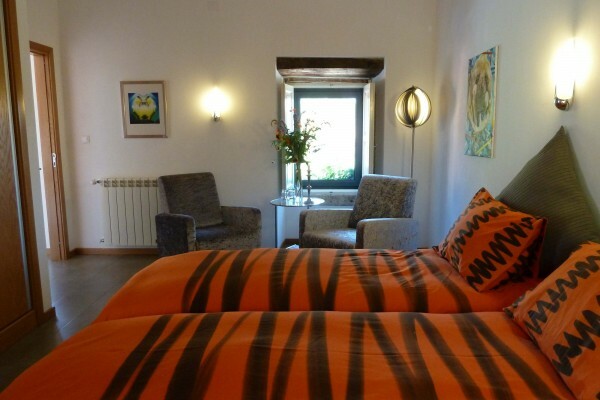 We offer different types of accommodation: bed and breakfast and a spacious apartment (75m2). At this lovely place you can take a rest, but it is also a perfect starting point to explore the rich culture of Central Portugal. Places worth a visit are for example: Coimbra, Tomar, Leiria, Nazaré, Alcobaça, Batalha, Fátima, Conimbriga, Buçaco. You can cool down in our pool, in the artificial lake (20 min. by car) at one of the little river beaches in the area or at the seaside (from 45 min. by car). You can make varied walks in the area. The two-hectares of land consists of lawns, terraces with mimosas, olive trees, cork oaks and fruit trees, an ancient wood, a little stream and water mines. It offers excellent views. In our village Maçãs de Dona Maria (1 km.) you will find 2 small supermarkets. There is a bakery, a post-office, a bank, pubs, and a pharmacy. There are daily markets in the surrounding villages. The bedrooms are located in the guesthouse. 2 spacious rooms are located on the first floor which you can reach by a natural stone staircase outside the house. 1 room with private lounge and terrace at the ground floor. Each room comes equipped with two single beds and a sitting area with two easy chairs. The rooms are nicely decorated and offer very nice views at the valleys and the hills. All rooms have its en suite private bathroom with washbasin, walk-in shower and toilet. All rooms are heated by central heating and have Wi-Fi. The comprehensive breakfast is served in our cosy dining room. 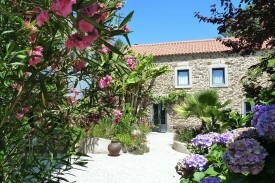 The apartment (75m2) sleeps 2 persons and is located at the ground floor of the guesthouse. It has its own entrances and French windows to the private terrace. The attractively furnished spacious kitchen is fully equipped with an original breadoven, woodburner, sink island, cooker with oven, dishwasher, micro-waves, washing machine and fridge/freezer. The cosy lounge also has a woodburner. The bedroom comes with two single beds incl. linen. En suite bathroom with 2 washbasins, walk-in shower and toilet. The bathroom is also accessible from the living room. The apartment is also heated by central heating and has Wi-Fi. 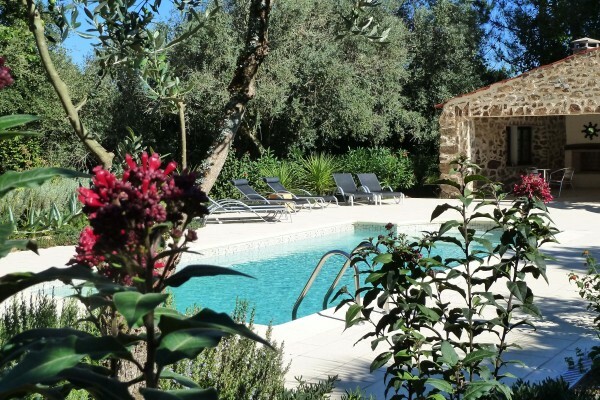 It has its own private terrace with comfortable garden furniture and a bbq. Ofcourse you can also make use of our swimmingpool. You can also rent the apartment for four persons, you will have an extra bedroom with ensuite bathroom on the first floor. prices including: water, electricity, central heating and wood. You can either do the final cleaning yourself or pay € 30. We can recommend you nice restaurants in the vicinity. No experiences yet with Casa do Alferes Curado. Be the first! Did you stay in Casa do Alferes Curado? Let us know what you thought about it and help others to make the right choice! * I confirm having stayed in Casa do Alferes Curado. 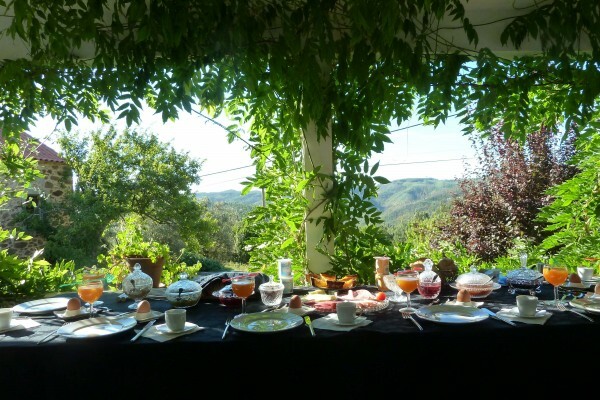 Find other bed & breakfasts in Maçãs de Dona Maria or all bed & breakfasts in Centro.